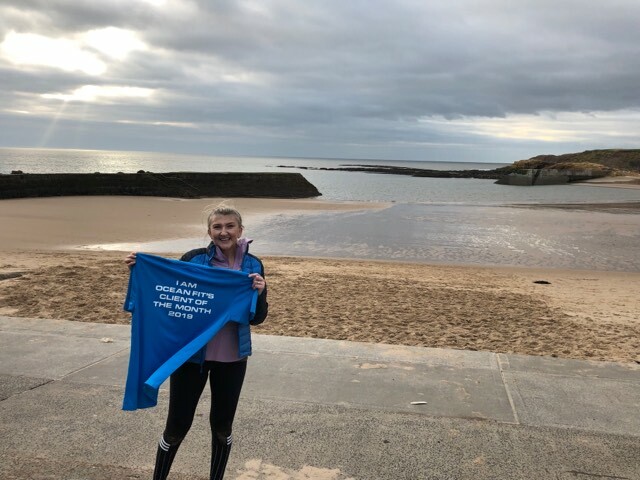 We LOVE this time of month….CLIENT OF THE MONTH…and this month its Natalie from our Group Personal Training Programme. Natalie originally started with us back in Spring 2017 with the husband on our Fit Camp Programme. They were actually the first 2 clients on the evening sessions when we first started them. How things have developed. Natalie always had self doubt in her ability despite absolutely caning it each session. However due a a string a life events could no longer continue but vowed to be back…and she was. But this time as a Group PT member. She has been on the programme since earlier this year. At the time looking for something to compliment her running and other activity. A lot of the what we do was new to Natalie but it didn’t take long for her to grasp the programme and get stuck in. As Natalie mentions below she has some discomfort in her knee which can slow down certain aspects f sessions.For a lot of people it would be too easy to skip these sessions. Natalie bursts in every week and is up for the challenge, of course she knows we can change any thing that is necessary to keep her constantly moving forward. Check out what she has to EFFING say below! I started at fit camp in 2017 with my husband to try and find an activity together that didn’t involve eating and drinking! My husbands work meant he couldn’t commit to all the sessions and I didn’t feel confident coming on my own so when we moved in Nov 17 I decided to leave, knowing I’d come back at some point. In Jan 2018 I’d decided that my current lifestyle and habits were not healthy and I needed to do something about it, my food and drink intake was affecting my quality of life and mental well-being. 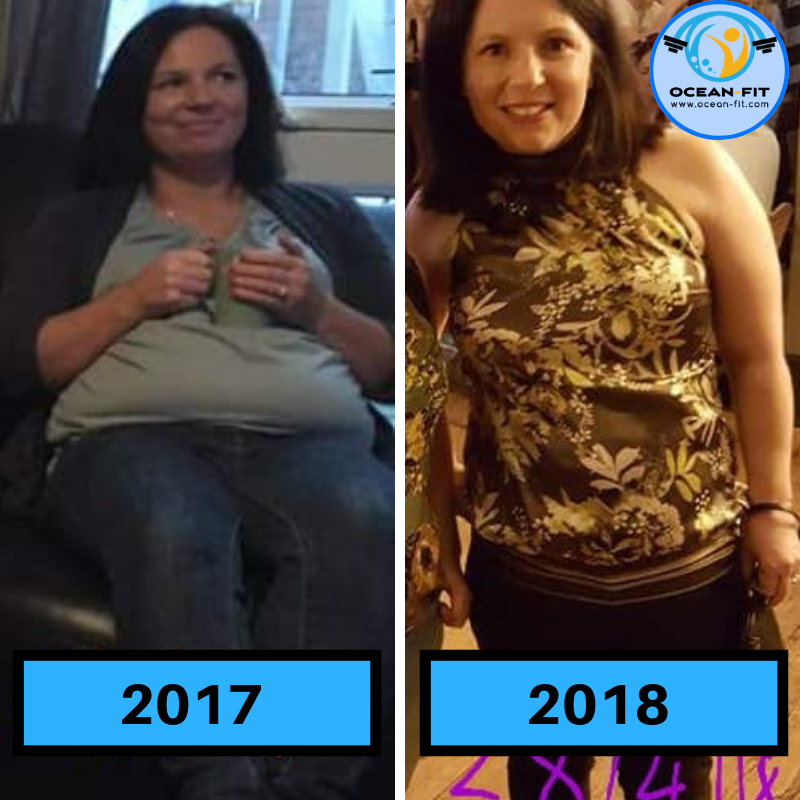 I decided to make exercise a priority and when I felt mentally strong enough I decided to take on a new challenge at Ocean Fit by joining their group PT programme, I wanted to focus on being strong and with that would naturally come fat loss.  All other gym classes in other venues I found repetitive and unsatisfying, Group PT at Ocean Fit allows me to challenge myself in a supportive, intimate environment, where the focus is on technique and improvement rather than getting things done at pace without supervision. I complain a lot and probably swear too much but it’s because I’m constantly pushing myself to limits I never thought I had. When everything feels hopeless then Aaron and Dan are always there to cheer me on and help me succeed, them and my group at my biggest supporters! The personal experience I get, I have osteoarthritis in my knee and some exercises for me feel impossible, nothing is impossible at Ocean Fit! Aaron and Dan are alway on hand to tailor things for me to make sure I’m not missing out and I’m still consistently testing myself with the team by making adaptions to any exercises I need, no other gym or class would give me that. Aaron was a massive factor, his enthusiasm for his clients and his community is admirable and his team reflect the same ethics as Aaron, everyone lives and breaths Ocean Fits passion and its very addictive! Everyone I have trained with is there for the right reasons, there are no egos, no competitiveness, just a genuine desire for everyone to succeed together. Every session I come away knowing I’ve tried my hardest and that I’ve been pushed to my limits. It never gets easier, it just gets more exciting! Each month I achieve something new by increasing weights, improving technique and learning new sets. I can never remember the names of anything I do! But my favourite exercises involve lifting weights, in any form! It’s a brand new experience to me and I love seeing bars, dumbbells and kettle bells laid out for me to lift! Make sure you give her a follow on Instagram for some real inspiration! Gah too many, sliders, bear crawls, push ups, burpees… All of which I only dislike as I need to improve my technique on. 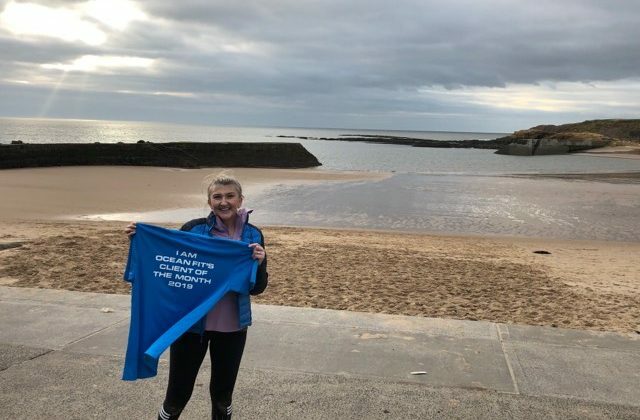 Ocean Fit has made me feel happy when I feel not so happy, its increased my confidence in my own abilities, it’s introduced me to some truly inspirational, dedicated team mates that push me on when I really don’t want to. I need to get better on what I eat but I do make a mean sweetcorn chowder! Coming back in the summer when I didn’t think I could hack being part of an existing PT group. I didn’t think I was strong enough or good enough. Aaron convinced me otherwise! It’s turned my life around in so many ways! Effing and jeffing in every session and immediately apologising as it’s very unnecessary, but totally necessary at the time!! (I love it when people swear in sessions, it shows a sense of realism. Also a lot of people find it uncomfortable to swear in public environment so it shows that they are really giving it all they have and cant hold back. Huge Huge HUGE well done Natalie – Its always a pleasure having you in our sessions. Swearing at everybody but trying your damn hardest. I look forward to seeing you develop further in your training as we head into 2019. If you would like to know more about our small team training and get involved with out Group Personal Training Programme when please don’t hesitate to contact us. We currently have 1 space on our Morning Evening and Late Evening sessions. We would love to work with more passionate and committed people just like Natalie who are willing to give it their all and improve from the inside out!